The market has a long history, dating back to before the turn of the century. In those days it was a small open market, no more than a handfull of stalls, between two shops. It was first covered in 1912 by the then owners Lloyds Estates. The markets colourful past includes a visit by Buffalo Bill's Wild West Circus in 1913, when they performed on the site of what is now the new covered area. 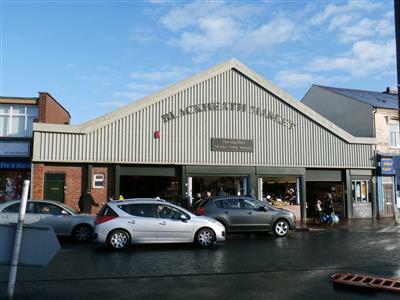 In 1978 the market was bought by a consortium of stallholders many of whom have been working the market for more years than they care to remember. Over the last almost four decades these stallholders have worked together to achieve the thriving market that is the centre of Blackheath's retail trade. There are now over 60 stalls selling a wide range of goods, there is something for everyone! Fresh Fish direct from Grimbsby every Friday morning! We occasionally have stalls available.